Most Asian-American restaurants serve the beer from the cuisine’s country of origin: Typically 33 Beer at a Vietnamese restaurant, Tsingtao when eating Chinese, Sapparo to go with Japanese, and Singha for Thai food. That’s essentially saying that every hamburger served overseas should only be washed down with Budweiser. More and more operators are awakening to the realization that they can do more, both in terms of their beer menu and their customers. So I took a look at what some of the best Asian restaurants with stellar beer programs had to say about that. As a testament to how great of a job my friend and colleague Ken Weaver did as the Beer Editor of FSR (a trade magazine for the, wait for it, Full Service Restaurant… and yes there is a QSR magazine), it took two of us to replace him when he left. That means every other month Jeff Cioletti pens a column about beer in FSR’s “Liquid Intelligence” department along with 8 beer reviews, and then we switch off. For my first column in the June 2016 issue, inspired by that thing we get inversely proportionally to beer (the sun. I’m talking about sunshine. ), I tackled the heady subject of beer menus at pubs with killer patios/beer gardens. 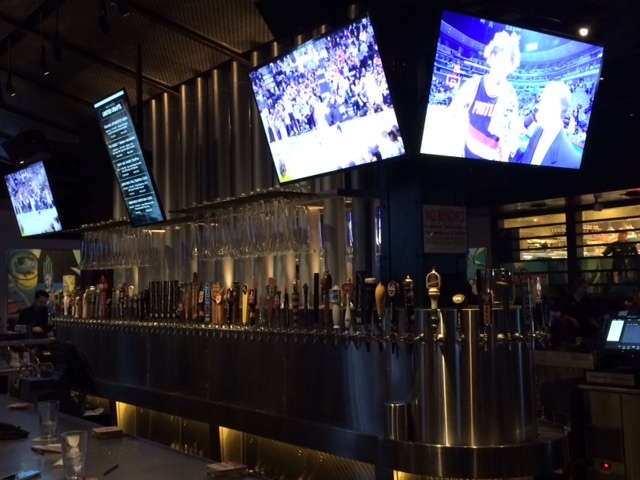 Amid the brewery acquisitions and Portland’s westside invasions, Pioneer Place is now flooding with beer courtesy of The Yard House, a sports pub/family dining restaurant that also, most likely, presents more tap handles than any single establishment in Oregon: 130. Yes, one hundred and thirty beers on draft. So let’s first focus on a bunch of numbers. 34: number of television sets throughout the Yard House, all airing games. 42: The number of the 130 total taps pouring beers from the Pacific Northwest. This actually represents the largest number of regionally brewed beers in the chain. 57: Locations in said chain, spanning 20 states. 3: Light/Lite beers available from the two largest brewing companies. All of the above underscores the impressive stats this outpost brings to downtown Portland that, truth be told, does not feel very Portland. If you want the geekiest beers on the westside, you’re going to head to Bailey’s Taproom. But Bailey’s’ 24 taps made me realize, Yard House offers as many taps as the top 7 beer bars in the city. Quantity over quality is never the better option, but here’s the deal: if you can get over the Yard House being a $585 million chain from Orange County, in a neck of these urban woods populated by other chains such as Qdoba, Jimmy John’s, and, egads, Buffalo Wild Wings around the corner if you want the lowest common denominator of sports bars, at least there’s a level of quality accompanying all those screens and mile’s worth of draft lines. Upon being invited in to explore the over the top menu, I’m happy to report that the Brussels sprouts atop “ripped” potatoes–described to me by their corporate executive chef Carlito Jocson as, “because potato skins are too eighties”) are crave-worthy. The Vietnamese banh mi sandwiches are pretty good for being this far west of 82nd Ave. You can order any of the tacos “vampire” style which entails grilling cheese on the outside til it becomes crunchy and hand-holdable. And most importantly, among those nearly eleven dozen taps, every level of beer drinker will find something with his or her name on it. Yes, there’s behemoth light American adjunct lager. But I also lost count of how many great IPAs they had on–yes, multiple IPAs because whoever tag-teamed on the beer list knew we demand such things. Boneyard RPM? Check. Boneyard Hop Venom to boot? Check-check. Ballast Point Sculpin is in the mix as well. The cider section alone trumped most places’ attempts at placation. When the house beer being aged in Pappy Van Winkle barrels is ready, you bet I plan to pop down into this basement-level resto and try it. 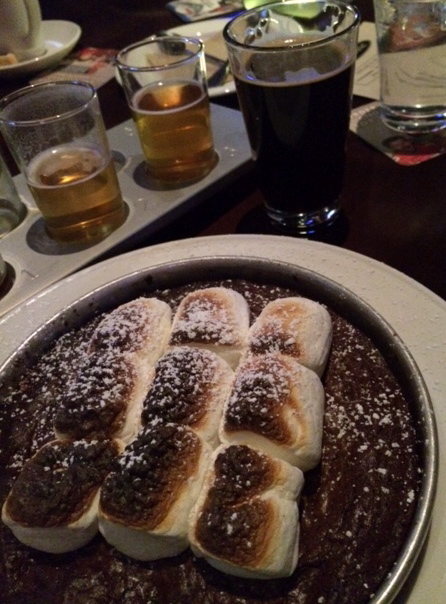 Speaking of how over the top they go, you can pair a Base Camp S’more Stout with the largest friggin’ s’mores brownie. The marshmallows were toasted to perfection though I found the brownie itself a bit dry. I guess that’s where the wet stout comes in handy. Got Burger? was the title All About Beer (Vol. 32, Iss. 3, 2011) went with for this expose of America’s prime burger’n’beer towns. These include not just overall awesome cities like Los Angeles and Kansas City but other microclimates, too, including Ypsilanti (MI), Adamstown (PA), Portland (OR, aka Burgervana) and, um, New York City.